1. heat oven to 350 f. spay 9-inch glass pie plate with cooking spray. in 10-inch skillet cook beef and onion over medium- high heat 5-7 minutes, stir occasionally until beef is thoroughly cooked: drain. sir in pizza sauce.until well mixed. 2. carefully unroll in pie plate pat dough in bottom and up the side of plate, leaving dough extending over side of plate. 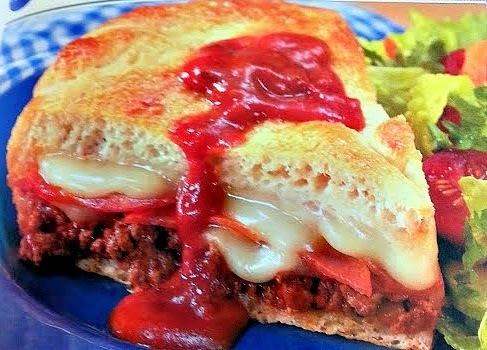 Spoon beef mixture into crust-lined plate Top with 1 cup of cheese, pepperoni and then remaining 1 cup of cheese. 3. In a small bowl, slightly beat egg and water, fold extending edges of dough up and over filling; seal all edges. brush crust with egg mixture. 4. Bake 38 to 48 minutes or until deep golden brown. Cool 15 minutes. cut pizza into wedges; serve with additional pizza sauce. yes thanks well do Cheryl! What a delicious recipe! My family would absolutely love this twist on pizza. :) Thank you for sharing at #GetHimFed, this recipe is being featured today. Hope you have a great weekend! !